WOWOWA and Yarra Pools have unveiled a proposal for a public pool at Melbourne's Enterprize Park as part of Hong Kong Business of Design Week. First announced as a concept in 2016, Yarra Pools is a not-for-profit community led proposal to re-establish recreation and water activities along the Yarra River's edge and transform an underutilised section of Melbourne's Northbank into a thriving community space. The concept has been inspired by urban river swimming projects both locally and globally, with the proponents behind the proposal citing global examples such as Copenhagen Harbour Baths, New York's Plus Pool, Paris' Canal Swimming Pool and Helsinki's Allas Sea Pool as sources of inspiration. 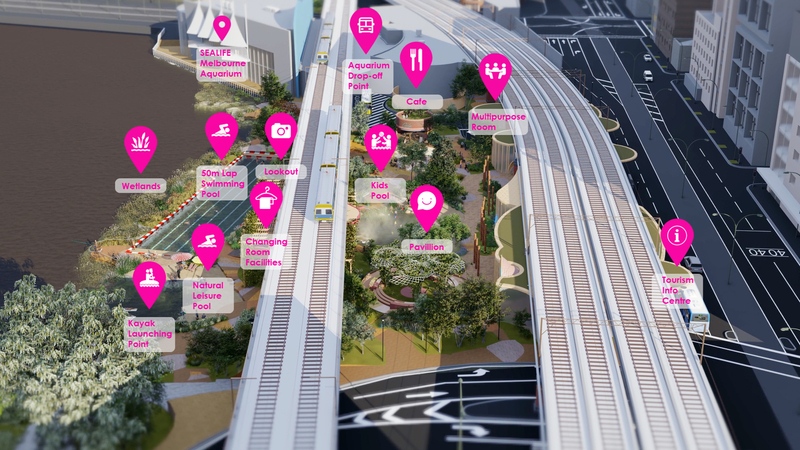 The Yarra Pools proposal however, has a distinctly Australian context, reflected in the inclusion of wetlands, a natural leisure pool and native vegetation. The purpose of the user needs analysis was to uncover, explore and validate the design principles while also collating ideas from key stakeholders to ensure any proposal meets the requirements of the community and can be used year long. Peak bodies that were consulted included existing traditional owners, Yarra River users, existing Enterprize Park users and the wider community in addition to peak sports, health and education bodies amongst others. Established in 2002, Hong Kong Business Design Week is touted as "Asia’s premier annual event on design, innovation and brands...(providing) a valuable platform for business and creative leaders to exchange ideas, network, and explore new business opportunities." For 2018, Melbourne is the partner city for the event and 'the largest presence within the conference's exhibition space,' according to The Age. "Our vision is to have Melburnians talk about our river differently. To be proud of the Yarra, and to see it as an active place of nature, recreation and play.’"
- Matt Stewart, Yarra Swim Co.
"This project builds on decades of work to return the Yarra back to the people. We dine, ride, run and row along the Yarra. Now it’s time to get back in.'" To the west of Enterprize Park a revamped Rebecca Walk is 'Opening Soon' according to its website. Combined both projects would go a long way in activating the rail viaduct under croft and currently underutilised spaces.